Irvine, Calif., Oct. 7, 2013 — An annual UC Irvine gala celebrating recipients of the UCI Medal raised more than $1 million, which will provide benefits for students through the prestigious Chancellor’s Fund for Scholarships and Fellowships. 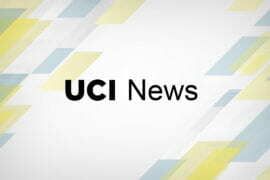 More than 600 guests turned out Saturday, Oct. 5, for the 2013 UCI Medal Awards. One of Orange County’s largest and longest-running philanthropic traditions, UC Irvine’s signature evening honors UCI Medalists for their profound impact on the university and the world beyond. This year’s awardees are Charles D. Martin, Ngũgĩ wa Thiong’o, and Cheryll and Richard Ruszat. Hosted by the UC Irvine Foundation, the 2013 awards ceremony was co-chaired by Dina and Emile Haddad, who also led the Medal volunteer leadership committee. Emile Haddad is the founder, chairman and CEO of FivePoint Communities and a UC Irvine Foundation trustee who is chairman elect and sits on its executive committee. The couple have been active supporters of UC Irvine for many years and sit on the Center for Real Estate Advisory Board for UC Irvine’s Paul Merage School of Business. The theme for Saturday’s event was “Shaping the Future,” inspired by UC Irvine’s $1 billion comprehensive fundraising campaign of the same name. It was selected to reflect the Medalists’ achievements as well as UC Irvine’s ongoing contributions of first-rate education and innovative research that have been compelling forces in Orange County’s rise into one of the country’s most economically robust, well-educated and highly desirable regions. Held at UC Irvine’s Bren Events Center, the gala featured a reception and formal dinner, Medalist tributes, and entertainment by students from the Claire Trevor School of the Arts. In addition, specially constructed video screens that spanned the entire width of the arena were used to honor past Medalists and provide a glimpse of UC Irvine’s future through three-dimensional imagery, music, photography, and motion graphics. Charles D. Martin is chairman and CEO of Mont Pelerin Capital, an equities hedge fund. During the 1980s and ’90s, he had a distinguished career as the founder and manager of two investment firms: Enterprise Partners, which became one of the top venture capital firms in America; and Westar Capital, a highly successful private equity firm. For the last decade, Martin has been senior adviser/partner to buyout firm ClearLight Partners. In addition, for 25 years, he co-owned TEC International, now known as Vistage, a management development program with more than 12,000 CEO members worldwide. Over the past 35 years, he has served on the boards of 46 public and private companies. Martin has been a trustee of the UC Irvine Foundation for more than a decade and is on its investment committee. He’s been on the investment committees of many prominent universities, including 10 years on the University of California Regents’ investment advisory committee, which oversees the endowment and pension plans for all UC campuses. At UC Irvine, Martin helped institute and is chairman emeritus of The Paul Merage School of Business Dean’s Advisory Board. He launched the school’s pioneering Polaris Investment Competition and has awarded 100 scholarships to MBA students through the program, now in its 10th year. He also led the creation and organization of the UC Irvine Chancellor’s Advisory Council. Martin and his wife, Twyla, are longtime philanthropists who support charitable organizations throughout Orange County. A trustee of Chapman University for 25 years, he was instrumental in founding the Orange County Museum of Art, where he’s chairman emeritus of the board of trustees. Working two jobs to put himself through college, Martin graduated from Ohio State University with five majors (mathematics, physics, chemistry, electrical engineering and business). In 2007, he was awarded Ohio State’s Benjamin G. Lamme Meritorious Achievement Medal for engineering alumni. He’s the author of four books and numerous published articles on investment strategy, global economics and public policy issues. UC Irvine Distinguished Professor of comparative literature and English Ngũgĩ wa Thiong’o is an internationally acclaimed novelist, essayist, playwright, journalist, editor, academic and social activist from Kenya. He launched his literary career at Makerere University College in Kampala, Uganda, in the 1960s with the critically acclaimed Weep Not, Child. The book is largely credited with opening the eyes of the Western world to postcolonial Africa. Ngũgĩ taught literature at the University of Nairobi from 1967 to 1977, when he was arrested by state authorities because of his powerful anticorruption novel Petals of Blood. Imprisoned for a year without trial at the nation’s maximum security prison, Ngũgĩ wrote his first book in the Gĩkũyũ language, Devil on the Cross, on toilet paper. Forced into exile in 1982, Ngũgĩ has since held faculty positions at several U.S. institutions of higher education, including Yale University and New York University. He was recruited to UC Irvine in 2002 to teach literature and direct the then-new International Center for Writing & Translation. Ngũgĩ has written some of his best work during his time at UC Irvine, including the highly praised Wizard of the Crow, winner of a 2006 California Book Awards gold medal for fiction. After 20 years of exile, he returned to Kenya in 2004 with his wife to promote the novel. Two weeks later, armed gunmen broke into their hotel and brutally assaulted them, an attack believed to be politically motivated. In 2010, Ngũgĩ published Dreams in a Time of War, a memoir of his childhood in Kenya; and in 2012, he released In the House of the Interpreter, shortlisted for the 2013 National Book Critics Circle Award. Ngũgĩ has received eight honorary doctorates and is an honorary member of the American Academy of Arts & Letters. He has lectured at such distinguished universities as Oxford, Cambridge, Harvard and Auckland. 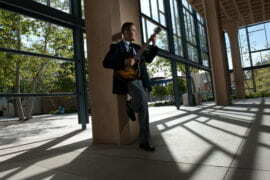 His wife, Njeeri, is director of conflict resolution in UC Irvine’s human resources department. As UC Irvine Foundation trustees, Chancellor’s Club co-presidents and former co-chairs of the UCI Medal Awards, Cheryll and Richard Ruszat have left an indelible mark on the university. Richard Ruszat has been an integral part of the ongoing success of UC Irvine’s $1 billion “Shaping the Future” campaign, which has raised more than $800 million with two years to completion. Cheryll Ruszat has served as chair of the foundation’s donor relations committee, and she also launched a program that actively involves trustees in personally thanking donors. The couple has also provided significant financial support to the campus for decades. The Ruszats joined the Chancellor’s Club in 1984 and are lifetime members who served as co-presidents from 1999 to 2002 and again from 2008 to 2010; they have also been co-chairs and co-vice chairs of its Daniel G. Aldrich Jr. Society. During their tenure, the club increased its number of events and its membership – including the addition of lifetime members. The couple co-owns four Montessori schools, one of which is University Montessori, on the UC Irvine campus, where Richard serves as president and Cheryll as executive director. Cheryll Ruszat is also the program coordinator and instructor for University Montessori as well as for the University Montessori Teacher Education Program through UC Irvine Extension. All four of their schools are accredited by the National Association for the Education of Young Children, and Cheryll Ruszat last year obtained accreditation for the University Montessori Teacher Education Program from the American Montessori Society and the Montessori Accreditation Council for Teacher Education. The couple have educated thousands of students since opening their first Montessori school in 1976. The Ruszats have been members of UC Irvine’s Social Ecology Associates and are founding members of the Premier Partners of the UCI Libraries. Cheryll Ruszat is on the School of Education Leadership Council and the Discovery Science Center board. Richard Ruszat serves on the campaign committee for Discovery Science Center and also chairs the Salvation Army Orange County Adult Rehabilitation Center advisory board. For nearly three decades of devotion to UC Irvine, the Ruszats in 2011 received the Lauds & Laurels award for outstanding university service.